Given the time of year, we expected this week’s UK chart to be a non-event. This isn’t the case, amazingly – GTA V has managed to take the top spot for a 14th time, following last week’s rise to #3. This puts the evergreen crime caper third in the list of titles that have spent the longest time at number one. It’s a very peculiar list indeed. 505 Games’ Zumba Fitness previously held third place with 13 weeks at no.1, followed by Wii Fit with 16 weeks and Who Wants To Be A Millionaire – yes, really – with a resounding 18 weeks. Eidos’ quiz show tie-in launched at the peak of the show’s popularity. The PSone version arrived at an impulse-buy price point of £19.99, and was shortly followed by PS2, Dreamcast and Game Boy Advance iterations. If you’ve ever wondered why WWTBAM on PSone is a common sight in charity shops and car boot sales, now you know why. Chart-Track notes that sales of Call of Duty: WWII and FIFA 18 – at #2 and #3, respectively – were remarkably close, making next week’s no.1 title hard to predict. Assassin’s Creed Origins held onto #4 for a 4th week while Mario Kart 8 Deluxe rose seven places to #5. In doing so, it becomes the UK’s best-selling Switch title, spending 38 weeks in the top 40. We imagine Zelda: BotW is currently the 2nd best-selling. It’s likely both will be superseded by Super Mario Odyssey over time, however. PUBG rose to #6, Star Wars Battlefront II fell two places to #7, Zelda: BotW climbed to #8, Forza Motorsport 7 took #9 while Super Mario Odyssey dropped to #10. Curiously, Gears of War: Ultimate Edition managed to re-enter at #15. The fact that it’s currently £7.99 at Amazon probably played a part in that. In what was an allegedly quiet week for game sales, GTA V managed to retake the UK chart top spot. This is its thirteenth week in total, putting it on par with Zumba Fitness. The two titles now share the third longest time span spent at no.1. Codemasters’ DiRT 4 rises to #2, giving it its highest position since launch. FIFA 17 moves up to #3, Ghost Recon: Wildlands re-enters the top ten at #4 – up from #14 – and then at #5 it’s Mario Kart 8 Deluxe, with replenished Switch stock to thank. Overwatch is at #6, ARMS falls from #2 to #7, Horizon Zero Dawn – last week’s chart topper – falls to #8, while the ever-popular Forza Horizon 3 is at #9. Then at #10 it’s Tekken 7. Injustice 2 and WipEout: Omega Collection both depart the top tne this week meanwhile, falling to #13 and #14 respectively. As for new enteries, 505 Games’ Dead by Daylight was the highest, arriving at #16. Final Fantasy: Stormblood made #23 while Ever Oasis entered at #28. We expected to see Call of Duty: Infinite Warfare still at no.1 in the UK chart this week, but instead the top ten has undergone a shuffle. It’s GTA V that takes the top spot, making it 10 weeks in total. This puts in a small band of other titles – including GTA: Vice City – that have also reached the milestone of 10 weeks at the top. Infinite Warfare can be found at #2. FIFA 17 moves down to #3, Battlefield 1 holds onto #4 and then at #5 it’s Forza Horizon 3. Watch_Dogs 2 sits at #6, Rocket League moves up to #7, Mafia III falls to #8, Steep slides to #9 while Gears of War 4 sees us out at #10. We’re still waiting on the first of 2017’s retail releases, and so there were no new entries this week. We did see a few re-entries at the bottom of the top 40 though, with Mario Kart 7, Infamous: Second Son and The Crew back at #35, #36 and #37 respectively. Titanfall 2 meanwhile look set to depart the chart, currently clinging in at #40. Surprise! GTA V has re-claimed the UK’s chart top spot for the first time since March 2015, making it nine weeks in total for Take-2’s crime caper. Chart-Track informs that it was a close call between GTA V and Uncharted 4: A Thief’s End, with sales just “a handful” apart. GTA V’s rise to the top spells the end of LEGO Star Wars: The Force Awakens’ five-week run; it was just one week away from breaking the record held by LEGO Batman 2. LEGO Star Wars: The Force Awakens is now at #3, with Uncharted 4: A Thief’s End holding onto #2. 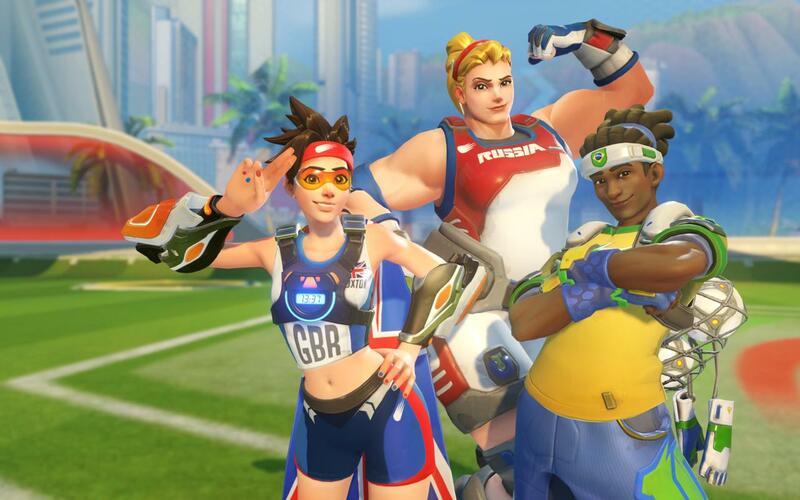 The Olympic bandwagon riding Overwatch rose one place to #4 while FIFA 16 dropped to #5. At #6 it’s Rocket League which, incidentally, was also the best-selling game on PSN last month. DOOM dropped to #7, Black Ops III hung onto #8, Ratchet & Clank went up one place to #9 and then at #10 it’s Minecraft: Xbox Edition. Tom Clancy’s The Division and Rainbow 6 Siege meanwhile both enjoyed a sales boost, pushing them back into the top 20 at #11 and #16 respectively. The only other top 40 occurrence of note was Disney Infinity 3.0 re-entering at #26. Retailers have begun clearing out their remaining stock, with starter packs dropping to around the £15 mark. Will the figures ever make it into Poundland, we wonder. With no new entries and GTA V holding the top spot for a second week running, this week’s UK chart isn’t exactly a thrilling one. The fact that a handful of Nintendo titles have moved up the ranks hasn’t escaped us, however. We put this down to last week’s impressively strong Nintendo Direct. In the individual format chart Mario Kart 8 shifts back into the top 20 (albeit at #20) while fellow pack-in Nintendo Land reappears at #25. The Wii U iteration of Super Smash Bros. rises from #32 to #27 in the same chart. And after almost vanishing last week, Captain Toad: Treasure Tracker crawls back up to #38. On top of all this, the original Disney Infinity saw a sales boost due to sizeable discounts. That’s back at #33 in the UK top 40 and re-enters at #5 in the Wii U chart. As for the UK’s top ten, it’s pretty much unchanged from last week. Chart topper GTA V is followed by FIFA 15, Call of Duty: Advanced Warfare, Far Cry 4 and Minecraft: Xbox 360 Edition to form the top five. Next week’s chart should be a touch more interesting – Saints Row IV Re-elected & Saints Row: Gat Out of Hell is out this Friday, along with a few other new releases. Despite being both the UK’s fastest selling and biggest selling game of all time, GTA V has only topped the UK chart five times. This week is one of those weeks. Call of Duty: Advanced Warfare – last week’s no. 1 – falls to #2 while FIFA 15 and Far Cry 4 hold at #3 and #4 respectively. Then at #5 it’s The Crew, marking the first time Ubisoft’s star striped racer has entered the top five. Notable risers this week include Shadow of Mordor, rising from #13 to #10, and Assassin’s Creed IV: Black Flag somewhat more significantly leaping from #27 to #11. That’s down to Xbox One bundle sales, apparently. The biggest fallers of the week meanwhile are WWE 2K15 – falling from #8 to #17 – and Wii U-exclusive Captain Toad: Treasure Tracker toppling all the way from #16 to #40. There were no new arrivals this week, and only two re-entries – Forza Motorsport 5 at #28 and Mario Kart 8 at #39. Poor old Toad – forever living in Mario’s shadow. It’s a little hard to muster up enthusiasm for the final chart of the year. There are no new arrivals and very few re-entries, plus the titles in the top ten are likely to remain there for weeks – if not months – to come. Every game in the top ten did however see a sales boost, with GTA V and DriveClub in particular enjoying stronger sales than during last week’s pre-Christmas chart. It’s Call of Duty: Advanced Warfare that occupies the top spot though, making it five non-consecutive weeks for the future set shooter. At #2 it’s GTA V, which is then followed by FIFA 15, Assassin’s Creed Unity and Far Cry 4 to form the UK’s top five. The Crew holds fast at #6, DriveClub moves up from #12 to #7 while the next three titles remain unchanged – Minecraft: Xbox Edition, Minecraft: PlayStation Edition and LEGO Batman 3. Glancing down the top 40 our attention is drawn to a couple of notable risers – LittleBigPlanet 3 is up from #20 to #13 while Alien Isolation goes from #35 to #24. As for the previously mentioned re-entries, Wolfenstein: The New Order is back at #32 while Sunset Overdrive leaps in at #34. Then at #39 Call of Duty: Ghosts makes a not particularly spooky reappearance. We thought Captain Toad: Treasure Tracker might have entered the chart due to the broken street date but that’s not the case. Not to worry – Toad’s arrival will make next week’s chart slightly more thrilling.